Thinking about starting a career in welding? It could prove to be a great decision since the country is expected to be a shortage of welders by nearly 300,000 by 2020. 1 Attending a welding school is one path to this in-demand career. What exactly would you learn in a welding training program? There are certain skills welders need in order to get a job in welding. You will need to know geometry and trigonometry for measuring angles, forming joints, and calculating the correct lengths. Basic skills with fractions and decimals are also required for working with blueprints, measuring the scope of a project, calculating material needs, cutting pipes, and welding at the correct seams. Besides math, you need to understand the properties of different types of metals. On a practical application level, you need exceptionally good hand-eye coordination. Once you decide to enter the field of welding, you have to look at what type of training programs are offered at different welding schools. For instance, Tulsa Welding School has a variety of programs. Welding training can be completed in as little as seven months. Only one day of classroom instruction is required weekly with the rest of the training involving hands-on application. This type of program is ideal for candidates interested in jobs that involve structural welding, pipe welding, thin alloy welding, and aircraft welding. Along with basic welding skills, special attention is paid to training in pipefitting and steam fitting. 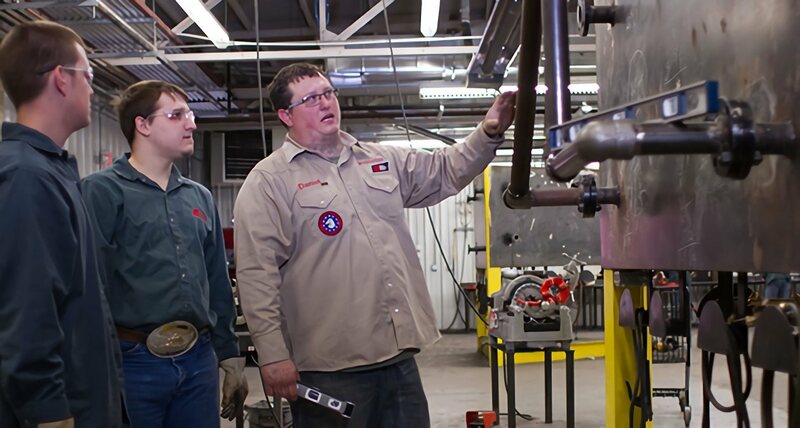 After completing the pipefitting training program and receiving your diploma, you should have obtained the skills and knowledge to test for your welder certification through the American Welding Society (AWS). A welding technology degree is a more advanced type of training program for welders entering the field. This program can be completed in over 15 months and prepares individuals for inspector and trainer level jobs, as well as features nondestructive testing techniques. Safety: Welding can be a dangerous job and not knowing the proper personal protective equipment required and safety protocols could result in serious accidents. Welding Processes: Different jobs require different types of welds. For instance, tungsten inert gas, or TIG welding, is preferred for architecture or automotive jobs where the weld has to have a polished appearance. Within the courses, you’ll learn whether wire, stick, or gas welding is an appropriate choice for a specific job. Welding Basics: An introductory class on welding will teach you everything about correct power voltages, metals, and consumables. Pipe Welding: Pipe welding classes teach individuals how to weld pipes in different fixed positions. Blueprints: You’ll learn how to read blueprints and interpret welding symbols. Inspection and Quality Control: For the AOS program, quality control within the welding industry will be touched upon as well as guidelines to follow when inspecting a welding project.